Arctic ‘frost flowers’: Clue to origins of life on Earth? Teeming with microscopic life, the “flowers” that grow beyond the northern coast of Russia in the ice-bound Arctic Ocean make for a surprising and little-studied phenomenon. The “flower fields” look more like a scene from an extraterrestrial world in a sci-fi movie. But could they hold the secret to the origin of life on Earth? What images does the Arctic conjure up? An ocean hidden under a layer of ice, a boundless snow-desert, wind, frost... This is one part of the planet where we certainly do not expect to see something resembling a field dotted with transparent white flowers. However, the Arctic happens to be home to an unusually beautiful, rare and little-studied phenomenon: “frost flowers.” It is here that nature has created some enchantingly unique filigree floral art. These “flowers” grow on thin, newly formed ice. Since water can pass from a solid to a gaseous state and bypass the liquid phase, a moisture-saturated layer, cooled and condensed by the 20-degree Celsius temperature gradient between the ice and the air, forms on the icy surface of the Arctic Ocean. For example, when the temperature of the newly formed ice in the moisture-saturated layer is around 0 degrees Celsius (32 degrees Fahrenheit) at an air temperature of minus 20 degrees Celsius (minus 4 degrees Fahrenheit), Arctic flowers — or ice crystals — grow a few centimeters high in a matter of seconds. 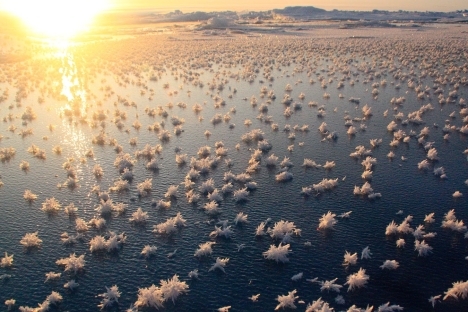 After a while, salt aerosols become deposited on the ice crystals; hence, frost flowers contain approximately four times as much salt as seawater. At first glance, they may appear to be completely lifeless crystals — but this is not so. They represent unique, miniature, temporary ecosystems. In the harsh Arctic conditions, there are far more microorganisms in the frost flowers than under the ice, for reasons as yet unknown. Each frost flower contains about one million bacteria. For this reason, some scientists propose that life on Earth must have originated in similar natural formations. Unfortunately, Arctic frost flowers are fragile and short-lived. As soon as new ice thickens and approaches ambient temperature, the flowers disappear. Furthermore, the distribution and height of frost flowers vary in accordance with the moisture-saturated layer, which can be very fickle. It is influenced by many factors, including the wind. Scientists warn that, despite all their beauty, frost flowers have a potentially damaging effect on the atmosphere. Sunlight triggers chemical reactions inside them, causing the release of a large amount of formaldehyde and bromine compounds that deplete the ozone layer. True — the extent of their impact on natural processes has not yet been fully ascertained. However, the rise in the amount of young ice, on which these flowers grow in the Arctic, should provide an incentive to further explore this natural phenomenon.